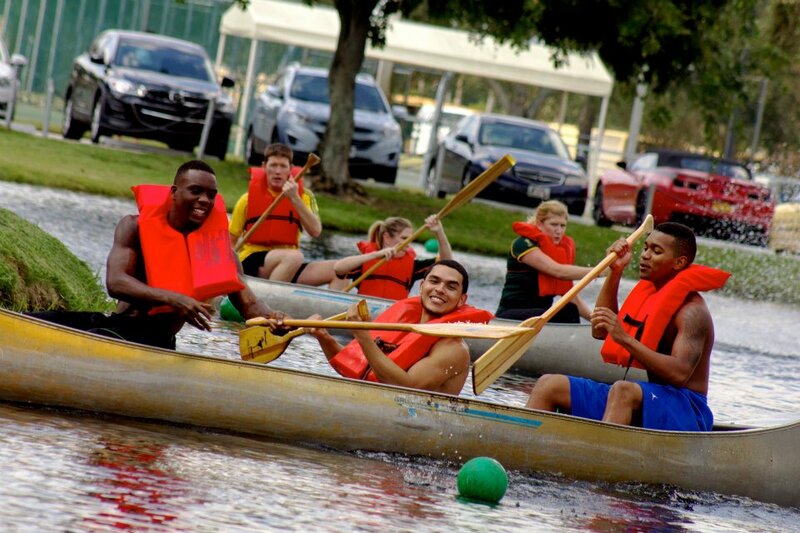 Above: Founders Day Canoe Race. Stock Photo. On Saturday, Lynn will turn 52 years old and today we are celebrating the school’s birthday with everyone’s favorite day – Founders Day. For new students, staff and faculty who do not know what today entails, they are in for a treat. Activities are going to be happening all day with the kickoff at 9 a.m. as people can grab their morning fuel from Corner Bakery along the main sidewalk. President Ross will then give a welcome address by the Freiburger Lake at noon to kick off the canoe races that start at 12:30 p.m.
For those who are not familiar with the canoe race, they are probably one of the most entertaining events at Lynn. Students, staff and faculty all come decked out in costume to race around the Freiburger Lake to compete for Best Team Apparel, Most Entertaining/Spectacular Sinking and 2-person speed race. Kettle corn and taco trucks will also be around for spectators to enjoy. After the canoe races finish, the Lynn community and their families are welcomed to the Founders Day Family Picnic and Festival on the Schmidt Lawn. Live music and food highlight the event, but students are normally most excited for the free shirts given out at the event. At the beginning of the Picnic and Festival, campus clubs and activities will take part in the Student Involvement Golf Cart Parade. Each club can reserve a golf cart and decorate it to represent them and, at the end of the night, one will be named the winner. Lynn has certainly grown over the past 52 years. Originally a women’s junior college named Marymount College, Lynn now has students from 90 different countries. The Fighting Knights also have 14 sports teams and 22 national championships. The school has also become more publicly known in recent years. In 2012, Lynn hosted the third and final presidential debate, which welcomed President Obama and Governor Mitt Romney to the campus. Just a few weeks ago, the Millennium Campus Conference, which brought in students from all over the world and global leaders like Kristin Davis and Nicholas Kristof, also took place on campus. Great things have been happening for years at Lynn and there are many great things to come. So, enjoy Founders Day today and remember that Lynn is the perfect home away from home.